Total Wireless is a Mobile Virtual Network Operator, or MVNO that operates on the Verizon network. MVNO's are typically small companies that don't have their own wireless network, but rather buy minutes, texts and data at wholesale prices from major networks that they then turn and resell to you the consumer. Total Wireless has been in service for nearly 2 years and it is actually a TracFone owned brand. All plans include unlimited talk and text. Mobile hotspot is not allowed. Limited time offer, new customers get 1.5 times more data than what's shown below! Price is average price over 2 months. To get this plan, subscribers must first purchase Total Wireless’s $25 unlimited talk and text plan, and then purchase a $10 – 5 GB data add on card. 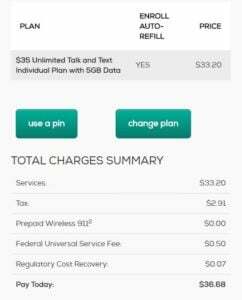 Autopay billing must also be enabled for the $25 plan. Any unused data in your account carries over from month to month without expiration. Additional data can be purchased with unlimited carryover priced at $10 for 5 GB. Price is with autopay billing enabled. $35 without. Price is with autopay billing enabled. Price is $50 without. A data add on card is available to add to any plan at any time priced at just $10 for 5 GB of data. The nice thing about the data add on card is that any unused data leftover on the card will carryover month to month for as long as you keep your service active. International calling is only available via the purchase of a $10 add on card. Total Wireless charges different rates depending on where you call. Rates start at 2.5¢ per minute for calls to Mexico. International texting is not supported at this time. I recently purchased an unlocked Motorola G 4 Plus that I activated on Total Wireless for a period of 30 days. I purchased a SIM card kit from Walmart (also available from Amazon and Total Wireless), and bought the $35 plan that includes 5 GB of data with unlimited talk and text directly from the Total Wireless website. Total Wireless gives an autopay discount of $2.80, and I enabled it at signup and to my surprise I was able to purchase the first month of service with the discount. Unfortunately, taxes and fees were not included with the price. In my area taxes and fees amounted to $3.48 making the actual price I paid for service $36.68. At the time of this review, this Total Wireless plan was the cheapest Verizon MVNO to offer unlimited talk and text with at least 5 GB of data. During my testing period, I ran 20 different internet speed tests at different times of the day and different days of the week. 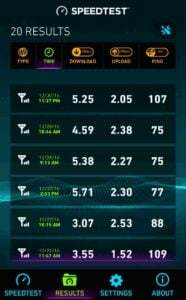 Speeds were pretty consistent regardless of the time of day or day of the week that they were run. I averaged download speeds of 5.17 Mbps, 2.03 Mbps upload and a ping time of 92.9 ms.
With real world use, I did not perceive any difference in website page load times compared to my main wireless plan on the T-Mobile network, where I use a LeEco Le Pro 3 as my main device. I found that I was able to stream YouTube videos at 1080p without any stuttering or issues. Using Netflix I also experienced no issues with the Netflix app set to stream on high, which the app says consumes about 1 GB of data per hour. I watched about 20-30 minutes of streaming video on each platform with no issues or complaints. I also listened to several hours of streaming audio via Amazon Prime Music, as well as Tune In radio. I was able to stream audio with no issue using either app and was perfectly satisfied with the service. Data consumption during the review was 3 GB. Admittedly, I am not big on speaking on the phone so my talk time was rather limited. I logged about 60 minutes of phone calls spread out over a combination of 10 incoming and outgoing calls. I had 0 dropped calls and had a signal everywhere I went, which was a nice change compared to my T-Mobile daily driver where for about 40 minutes a day I'm in a building with no signal. My location still does not have T-Mobile band 12 support, but I digress. Phone calls were clear but I did hear a small amount of background static. The small amount of static was confirmed to be caused by the phone itself, because I heard the same sound while placing a call over Wi-Fi using Google Hangouts. During the test period I sent and received roughly 800 text messages and dozens of MMS picture messages. All text messages were sent and received successfully, however, a few MMS picture messages sent to a Cricket Wireless number got lost in space and never delivered. I believe this issue to be due to how Cricket/AT&T and Verizon handle MMS messages but not the fault of Total Wireless. I believe this because the same issue occurred on occasion when MMS picture messages were sent to the Cricket number from a phone on a Verizon post paid plan. The culprit here is likely due to the picture messages being sent are slightly larger in size than what AT&T/Cricket can accept. I was able to successfully tether my phone to my PC and watch YouTube and Netflix as well as browse the internet. The test I conducted lasted about 20 minutes. I did not have any issues or notice things loading slower compared to my main cable network which gets download speeds of roughly 20 Mbps. 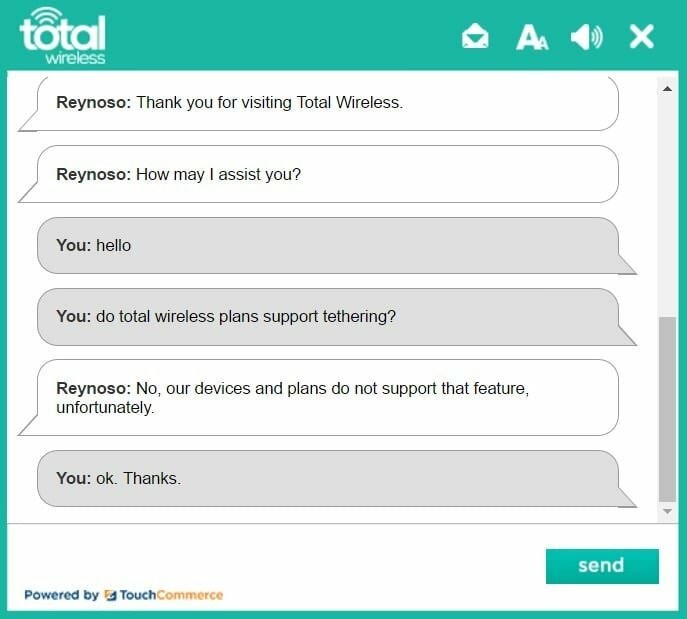 Tethering is not officially supported by Total Wireless, so if you are going to try it yourself, you are using at your own risk. Total Wireless may choose to send you a warning not to Tether or to disable your account if they find your are abusing their network. Some say customer support is the bane of any TracFone owned brands existence. A search on the internet and you'll likely find quite a few loud voices complaining about customer support issues. During my time with the provider I did not have any need to contact customer support for any issues. I did however contact them several times both through their online chat service and over the phone to test wait times one may have if they do in fact need to contact customer support. I initiated a chat with Total Wireless on 6 different days using different time points. The average time it took to get my chat answered was just 2 minutes, and this includes initiating a chat just 2 days after the Christmas holiday when one may expect customer support to be more heavily taxed during the holiday season with people activating their brand new devices. On one of the post Christmas chats, the chat service told me that they were "experiencing a high volume of chat at this time and to please try again later." I elected to wait, and reached a customer support representative just 6 minutes later. I placed 5 different calls to customer support and the longest wait time that I experienced was 6 minutes and 45 seconds. Two of my other calls were answered by a customer support representative instantly, while another call took 2 minutes. When my calls weren't being answered instantly I was given the option to either wait or have Total Wireless call me back within 3-5 minutes. Since I did not have any issues to discuss with customer support, I disconnected the call once answered. To my surprise, I found that when I hung up the phone, a real person from customer service called me back instantly and left me a voicemail notifying me that my call was disconnected and that I could call back to discuss my issues. The fact that I got called back right away after a disconnection is appreciated and likely will be appreciated by anyone who has ever had a phone call dropped during a support issue only to find that they have to call support back and start all over as if the call never happened in the first place. Porting in was not tested as this was a new line of service with a new number. Porting out required me to call Total Wireless to ask them to release my number. The call to the company was answered instantly by a real person, however, since it was a port out, I was transferred to another department which took 30 minutes to be answered at 8 PM in the evening on a week night. I had to call Total Wireless to ask them to release my number because I gave the wrong account number to my new provider. If you end up needing to port out from Total Wireless or are porting out from any other carrier, I suggest you initiate your port out several days before your plan expires to avoid losing your number. 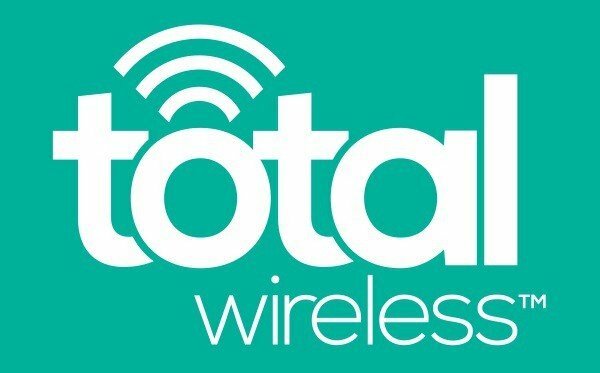 Porting out to another carrier from Total Wireless requires you to give that carrier your phones IMEI number, which is what is used as your Total Wireless account number. Your account pin number for porting out by default is 0000 unless you set it to something different. 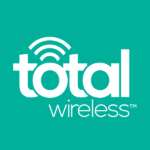 My experience with Total Wireless was a good one, and based on that I would have no problem recommending the service or using the service for myself, although since I use a lot of data, the T-Mobile plan is still a better choice for me. 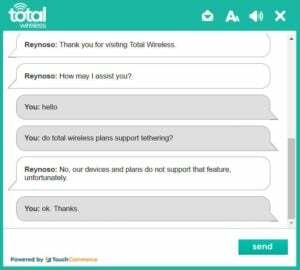 A majority of those who do choose to signup for service with Total Wireless should find the network and service suitable for their needs, unless of course they are one of the unlucky ones who have a need to contact customer support with a serious issue. See also: | Total Wireless news and deals, New subscribers get 1.5 times more data! We have three phones on the 20 GB family plan. For the second month in a row they claim we used more data than our phones show. This month they say we used 19.4 GB while our phones show we used 5 GB. Customer Service says they cannot give me up-to-date usage amount. Would be handy if customer service agents could speak better English. I’m tired of renewing the plan early. They may be forcing me to look elsewhere. The restriction on tethering is a big deal. We travel a lot and need that. Furthermore, if I pay for 5 GB of data, it’s MINE MINE MINE and it is up to ME how to consume the data. Period. Has anyone with an Iphone had any success getting the Mobile Hotspot to work ? Mobile hotspot is allowed. I use it frequently when traveling. Galaxy S8. Having it work for your particular phone does not mean it’s allowed. It’s not allowed. It’s stated explicitly in their terms. I’ve been with Total Wireless about 7 months. Initially, my 5G LTE data was about what my LG phone data reflected. For the last 2 months, the data differs by over 2GB from what my phone indicates I have used. Whenever I’ve contacted TW customer service (only by phone call) they promised a phone call back. I NEVER received a call back. I was initially on a different APN than what I am on now. A bunch of runaround BS and I get the same customer service reps using different English names, but East Indian accents. Before trying to activate WiFi calling, did you register your e911 address on TracFone’s website? That is needed to get WiFi calling to work with TracFone branded service like Total Wireless. I also question the validity of what they list on their website in regards to WiFi calling and am not sure it’s very accurate. From what I gather, most subscribers say it doesn’t work. But at BestMVNO, I still have to go by what’s officially listed on their website.